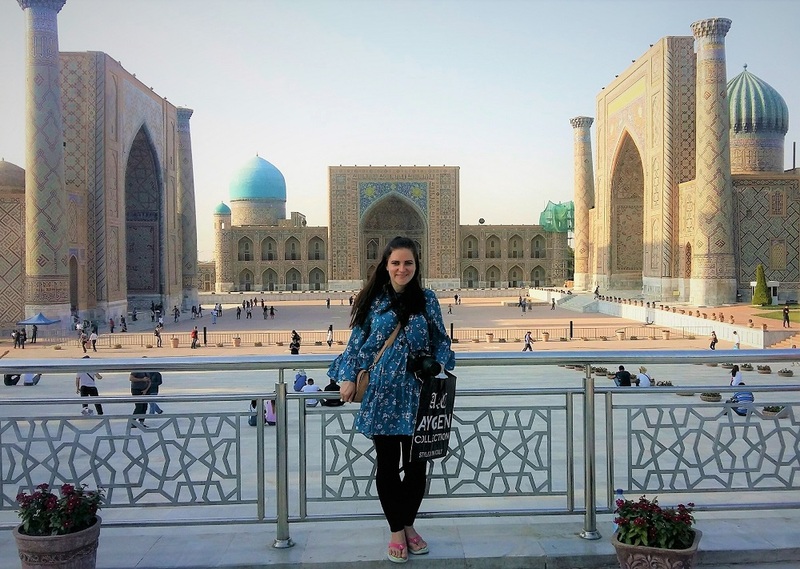 Uzbekistan – a Central Asian country that was barely on the tourist map up until recently. It captured my attention and inspired me to visit it after I came across some stunning pictures of the country on Instagram. When I spent eight days exploring its ancient cities I was not disappointed. In fact, Uzbekistan is one of the most charming destinations I have ever been to. I was very excited to have the opportunity to visit there because this destination was far from familiar. Uzbekistan really surprised me in a very positive way. I anticipated it to be puzzling and filled with vivid architecture. As we soon discovered, this country is all of this, and more; very laid-back, clean, safe, easy to travel around and the people are truly warm and welcoming. The former Soviet Nation is known for its spectacular mosques, remarkable mausoleums and other sites linked to the Silk Road – the ancient trade route between China and the Mediterranean. 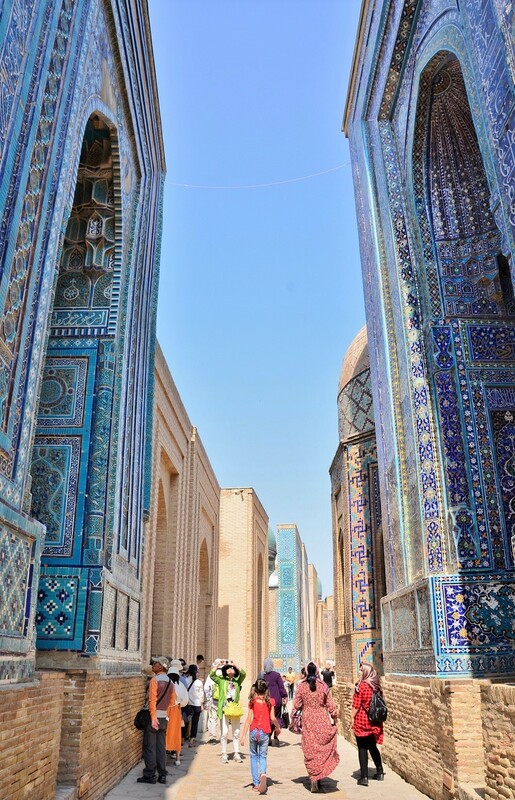 The most visited cities in Uzbekistan are Tashkent (the capital), Samarkand, Khiva and Bukhara. 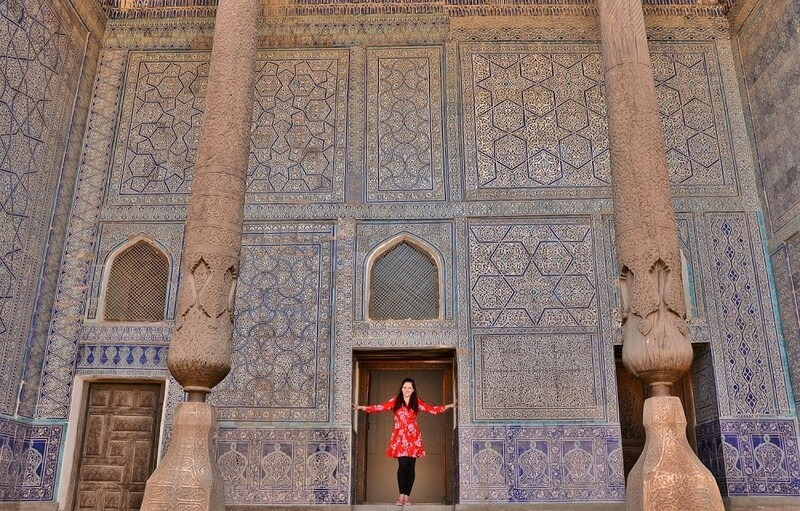 We had only 8 days in Uzbekistan, so we decided not to visit the capital, but spend the entire time exploring three ancient and must-see cities in Uzbekistan; Samarkand, Khiva and Bukhara. We started our trip in Samarkand. We flew into Samarkand from Moscow and stayed in the old part of the town. The new part of the town is very modern, so we decided to stay and explore the more exciting old part, which is also closer to the main attractions. 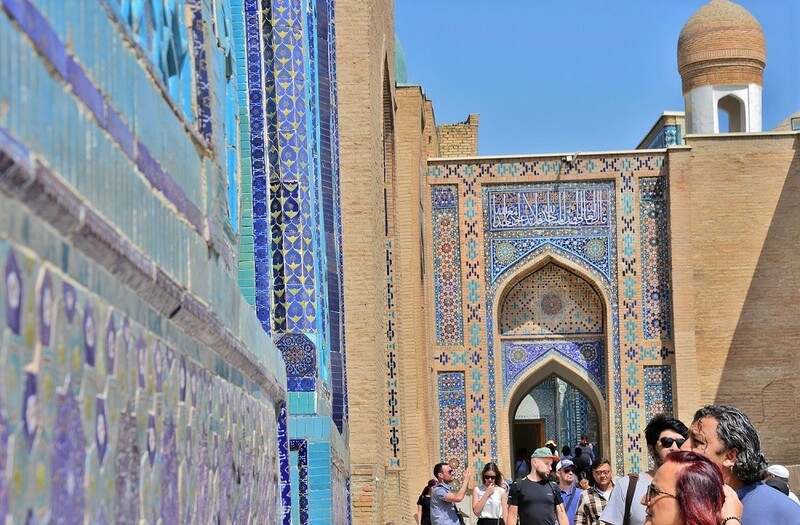 The number one attraction in Samarkand is the landmark of Islamic architecture – the Registan. The Registan dates back to the 15th and 17th centuries and includes three madrasahs with rich mosaic decor, carved ceramic and marble decor. The site is gigantic and absolutely striking. You could see the site in a few hours, but if you are not in a rush you could spend at least half of the day here. This place is peaceful and relaxing and the architecture is simply spectacular. Uzbekistan has a very rich history. As a result, its breath-taking architecture is influenced by Islamic, Persian and Russian styles. The spectacular bright gold and blue tile work, and intricate geometric designs are symbols of the nation’s history. One of the greatest examples of this stunning architecture is the Registan and Shah-i-Zinda. 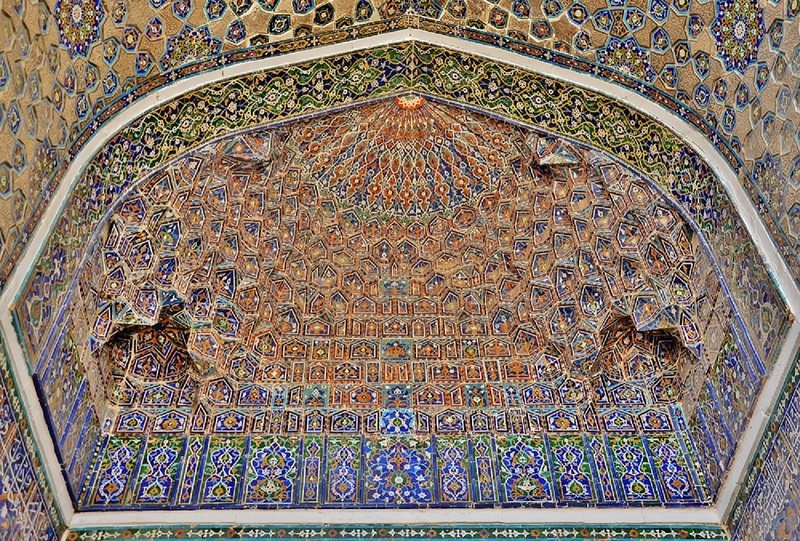 The Shah-i-Zinda complex contains rows of picture-perfect sparkly blue colour tombs. The various mausoleums are grouped along the narrow streets and here you can find eleven mausoleums in total, which were built one after the other in the 14 – 15th centuries. The detail on each tomb is so different from the next and many of the interiors are equally as decorative. They are simply spectacular. 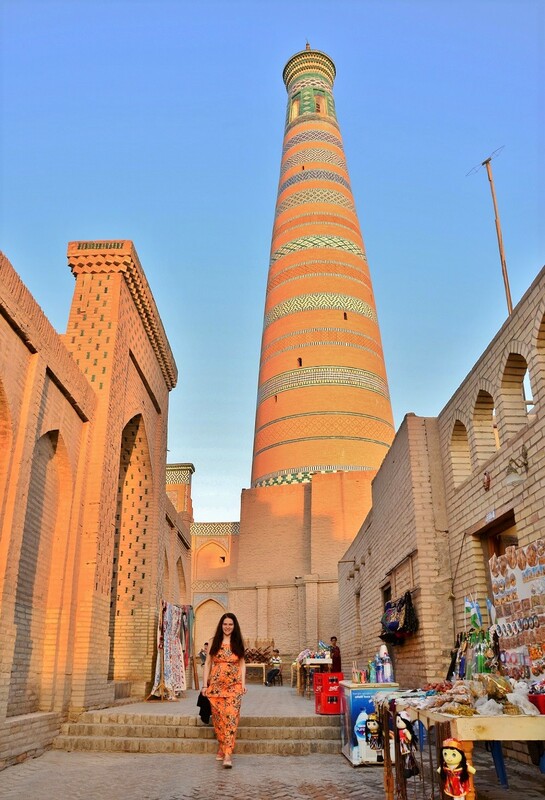 Khiva, my favourite city in Uzbekistan, can be described as a living museum. Unlike Samarkand, where the top attractions are not clustered together. In Khiva all top attractions are located within the walls of the old city known as the Ichan Kala. The old city is protected by Unesco, but still inhabited by Uzbek families and businesses. Small, charming streets are fully pedestrianised and the old city is quite small so all attractions here are within walking distance. There are many museums in this city and the best way to see them all is by purchasing the pass (20,000 Uzbekistani so’om ~ €10), which will give you access to 15 museums located within the walls of the old city. (You can purchase this pass at the Western Gate, beside the Khiva Orient Star Hotel). Khiva is a very laidback town: quiet and relaxing but be sure to get yourself out of bed early and go exploring inside Khiva’s old city, just as the city begins to wake up. I found these early morning hours to be truly peaceful and relaxing, and less busy, making this a great time to take many beautiful photos. 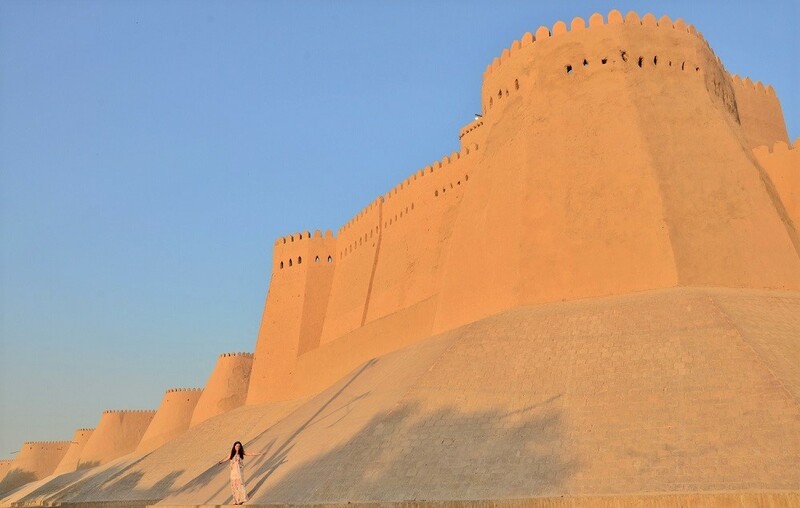 Also, make sure to walk outside the old city walls, as the wall looks even more impressive from outside the old Khiva city. 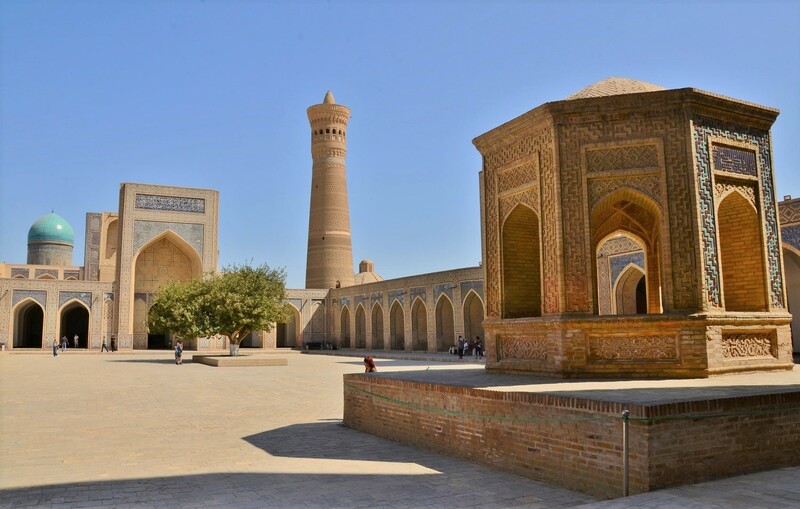 Another attraction that you simply cannot miss in Khiva is Juma Mosque. It has no domes, no arches and there are no grand portals marking the entrance of this utterly uncharacteristic building, but the beauty lies all within. 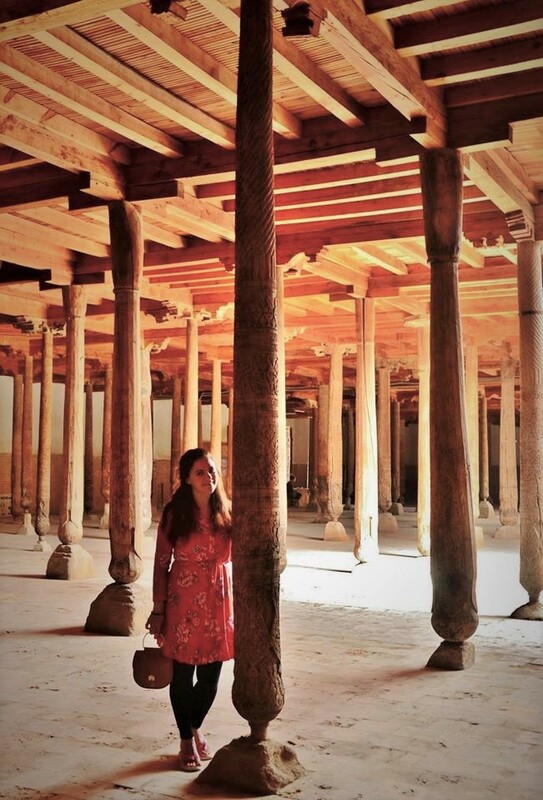 213 wooden pillars, each carved in a different style, each from a different period are spread throughout an internal courtyard. Some of them are said to be carved back in the 10th century. One more attraction in Khiva, which should not be missed is Kurnysh-khan Palace. More than 200 years old, these palace walls are covered with mosaic panels and decorated with floral and geometric patterns, and it is simply stunning. Currently there is no train service between Khiva and the last city we visited in Uzbekistan – Bukhara, so the best way to get there is by hiring a car. 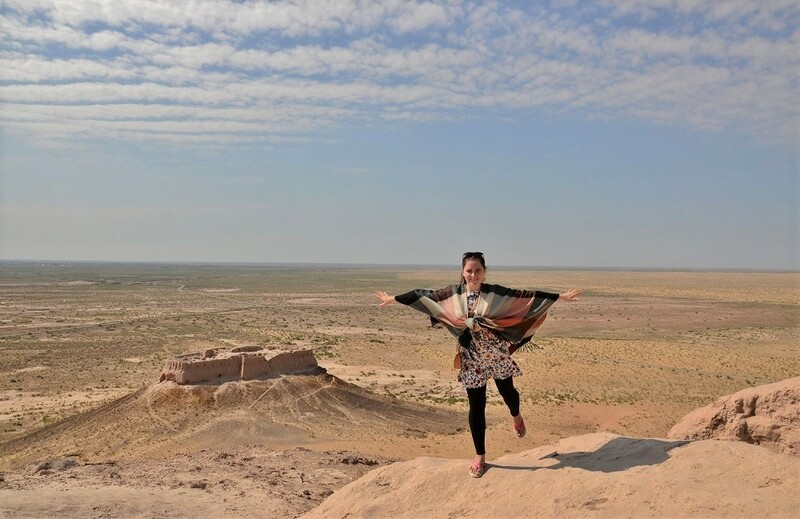 It is a long drive, as it can take over six hours, however, the best way to break up the trip is by going to see the ruins of famous Uzbek fortresses. 2,000 years ago, people who lived in the rich Amu-Darya delta built many fortresses to defend themselves against the invasions of nomadic tribes, who lived with their herds in the Kyzyl-Kum desert. Most of the fortresses are located at the edge of the Sultan Uiz Dag mountain range. Going to see the fortresses will add an extra couple of hours to your trip, but it is so worth it. Bukhara city is more than 2,000 years old and it is the most complete example of a medieval city in Central Asia. Monuments of interest include: Ark of Bukhara, Lyab-i Hauz, Po-i-Kalyan, Kalyan minaret, Chor Minor and a large number of 17th-century madrasas. In my opinion Bukhara is the most tourist-oriented town out of the three cities we visited in Uzbekistan, which has its benefits too. 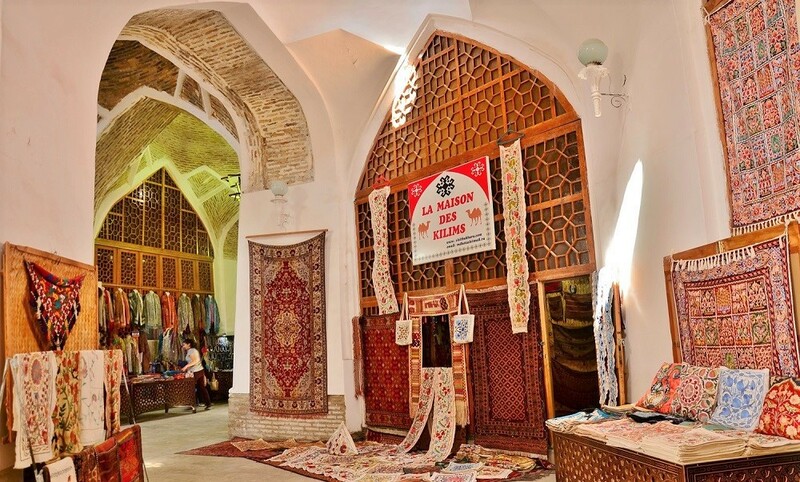 For example, in comparison to other two cities, Bukhara has a huge variety of restaurants and many souvenir shops. A small tip – souvenirs are cheaper here, so I would recommend waiting until you get to Bukhara to buy all your presents and souvenirs. This was the last city we visited in Uzbekistan. Most top attractions in Uzbekistan’s are served by low-cost domestic flights, good road links and high-speed trains. You will find shared taxis and bus services in all the cities, which makes getting around Uzbekistan very easy. We chose to take an overnight train from Samarkand to Urgench, which is just about half an hour drive from Khiva (you can get a taxi or a bus from the train station to the old town of Khiva). The train was very comfortable and departed and arrived at the precise scheduled time. To get around the cities in Uzbekistan is also very easy as government regulated taxes (yellow colour) are operation in all major cities. They are very cheap (30-50 cent for a short journey). However, do agree the price with the driver in advance as they didn’t seem to have taxi meters. 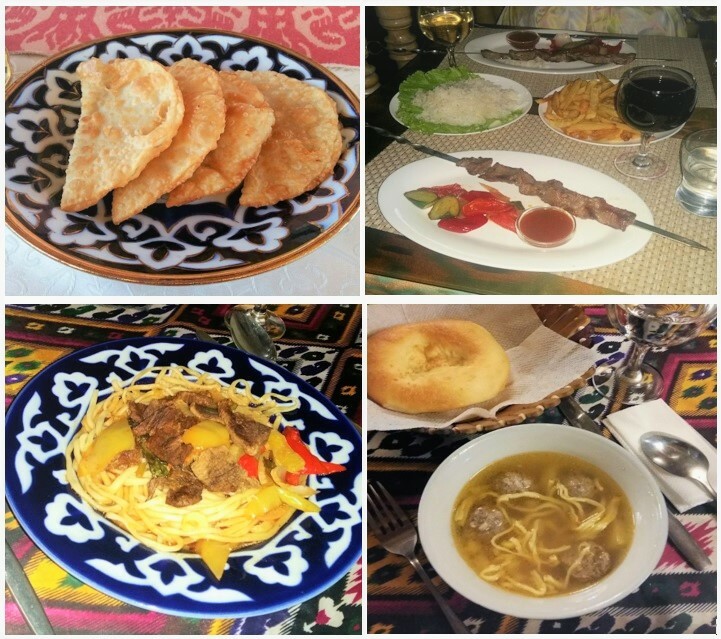 Uzbek cuisine has some of the most delicious food in Central Asia, with a unique blend of flavours and styles from the East and West. Be sure to try their delicious somsa and samsa, shashlik (kebab on a skewer), lagman (noodles with mutton) mouth-watering plov (rice with carrot and mutton) or manties – Uzbek dumplings. Uzbekistan is truly a paradise for shopping. 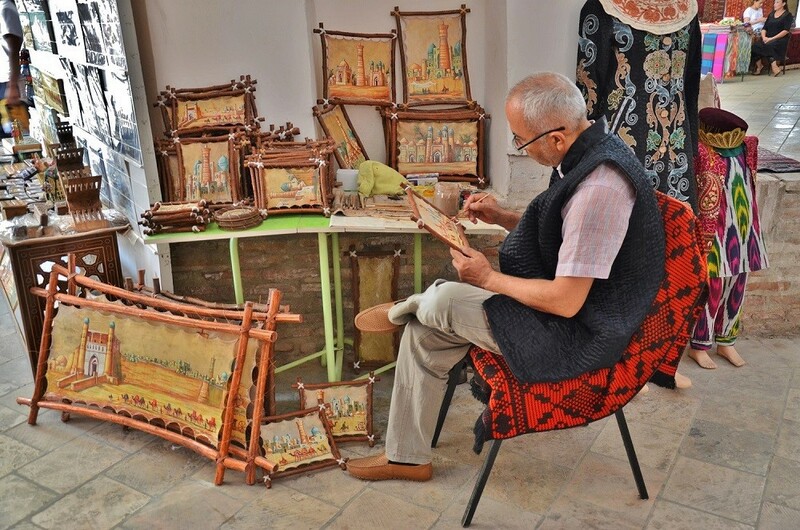 Wander the famous markets and bazaars to find colourful silk scarves, beautifully decorated ceramics and other unique souvenirs that you never knew you needed. In early September the weather in Uzbekistan is very nice and this is probably one of the best times to visit Uzbekistan. The weather is still very hot during the day, but it is nice hot (around 32 degrees) and cool, but not too cold in the evening. Most hotels in Uzbekistan prefer if you pay for the hotel in cash (in US Dollars). It is worth noting that especially in Samarkand and in Khiva there were only a couple of ATM’s in the whole city which accepted VISA cards. I would strongly recommend bringing USD from your home country as you might run into difficulty withdrawing money in Uzbekistan. 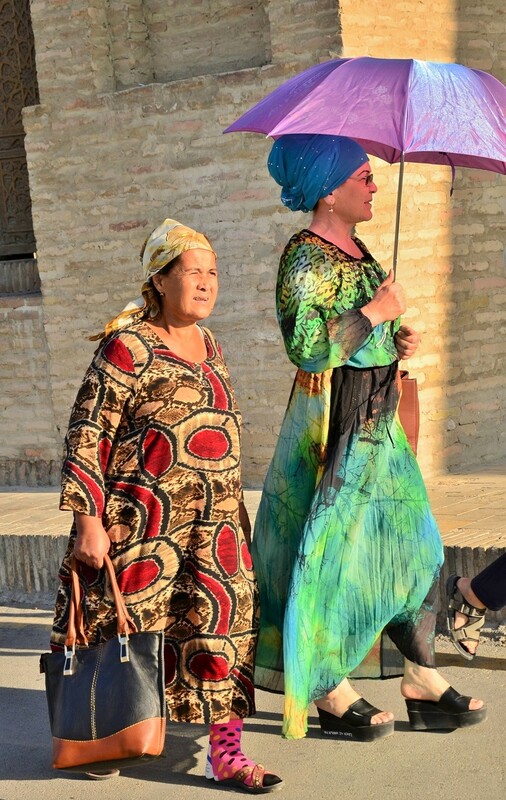 In Uzbekistan women do dress more conservatively than in Europe, but, tourists are not required to dress very conservatively. Ladies do not need to cover their heads when entering the mosques or other religious sites. However, I would recommend sleeves (short ones will do), knee-length skirts and minimal cleavage, as it would demonstrate that you understand and respect their traditions. Local ladies love brightly-coloured dresses, often with sequins and matching harem trousers and if you wish you can pick up some eye-catching ensembles for a few dollars in most bazaars. I travelled with a female friend and we found it extremely safe, even if out late at night. Travelling on the overnight train was a very positive experience and we never felt uncomfortable or unsafe at any time. The locals are also very helpful even with limited knowledge of the English language. Locked in the heart of Central Asia, Uzbekistan is both a museum to the ancient Silk Road and a country shaking off its Soviet past, while striving to develop its place within the modern world. This mixture of old and new is what makes it so special. Visit Uzbekistan for its culture and fascinating history and you will undoubtedly fall for this beautiful country and its friendly people.